The first fossil human specimen was a Neanderthal child's skull found in Belgium in 1828, but its importance was not realized. The first skeleton was found in 1856 in Germany, a slouched and injured specimen, named Neanderthal man after the Neander Valley where it was found. This poor individual became the type 'cave man', our brutish forebear, coarse of limb, hairy of body and small of brain. He grunted at his fellows, tore raw meat from the bones of prey animals, dragged his wife along by her hair and huddled miserably in caves to keep warm. clearly ancient, and yet a brainy forebear. Not only that, he was English! In 1925, Raymond Dart announced an even more ancient skull from southern Africa, which he named Australopithecus africanus. 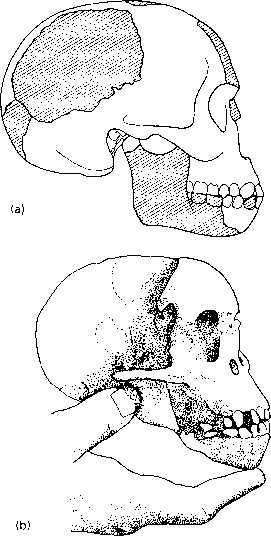 It was a child's skull (Figure 11.7(b)), with a small ape-like braincase. Dart's new fossil was greeted widely with scepticism. Surely it was only a fossil ape, with nothing to do with our ancestry? Piltdown man proved the 'brain-first' model. During the 1950s, two important chains of events overthrew the received wisdom on our ancestry. First, Piltdown man was shown to be a forgery—a recent human braincase with a modern orang-utan's jaw. The great champions of Piltdown man, the anatomists Elliott Smith and Arthur Keith, and the palaeontologists Arthur Smith Woodward and W. P. Pycraft,had died. The second set of events took place in southern Africa, where many specimens of Australopithecus had been coming to light, and the weight of new material was proving harder to discount by the supporters of Piltdown. 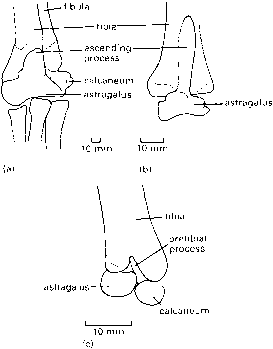 The unmasking of Piltdown in 1953 passed without any major public dispute, and scientific attention focused on African fossils of early, small-brained bipedal humans.